What would be your opinion of substituting the Vanguard High Yield Corporate junk bond fund VWEHX or another high performance Vanguard Bond fund like VWESX, Long Term Investment Grade bond fund, instead of the Vanguard Total US Bond fund to make up the bond part of the Bogle theee fund portfolio. My opinion would be that it is a terrible idea by someone who probably shouldn't be making changes to a portfolio, especially if they're using words like "high performance bond fund". What role does Vanguard's Total Bond Fund have in a the 3-fund portfolio? Why do you think junk bonds fill that same role? It's not crazy to own high yield bonds. But I think I would want more compensation for risk than is currently available. High yield bonds may not be part of Boglehead canon. Although Jack Bogle was a fan of corporate bonds. Last edited by whodidntante on Sun Apr 14, 2019 8:30 am, edited 2 times in total. I would say neither one should be the only bond component of a 3-fund portfolio. 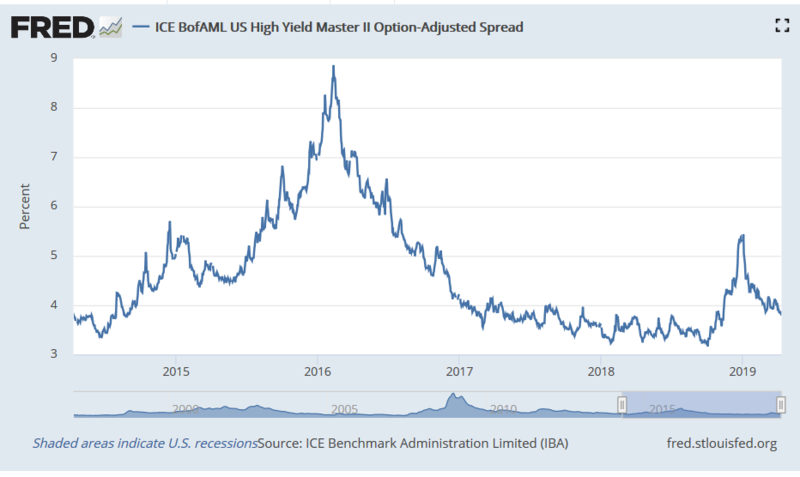 Now, if you said some combination of high-yield, international (maybe with an extra weighting of emerging markets) bond, GNMA, floating rate, plus the usual higher-quality bonds or CDs or other fixed income... maybe you'd get some traction on that. But the percentage wouldn't be the same - you would have some equity risk in that bond mix. And you might not be able to use it for rebalancing, but I have to say that when the economy really goes downhill, I'm not convinced most of us will rebalance. Some will for certain but a lot of us - no matter what we say during better times - have all we can do to avoid the temptation to bail. Not during little blips like this past December, but during, for example, the '70s, when you have a long, grinding downturn. I have a chunk in all the bond categories I mentioned, but know myself well enough to know that I won't rebalance so I don't have any funds appropriate for that. Funds like short/intermediate investment-grade definitely don't make the cut.